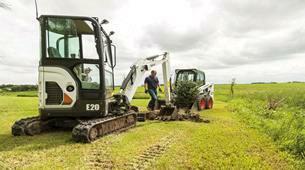 The Bobcat E20 Mini Excavator delivers impressive performance in tight areas with minimal repositioning. Hydraulically retract the undercarriage to only 39 inches to travel through gates or between homes, then expand to 54 inches for a wider footprint and greater performance. 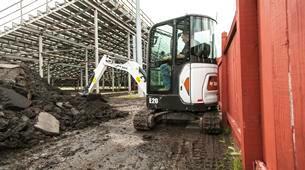 The E20 has zero tail swing for versatility and maneuverability on the most compact of job sites. Available with 9" or 13" bucket. 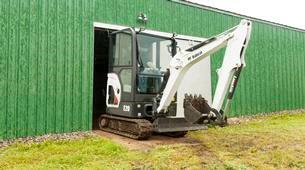 * Please call us for any questions on our excavator bobcat e 20 with thumb rentals in Durango CO, LaPlata County, Mancos, Ignacio, Cortez, Bayfield, Pagosa Springs, and Silverton CO.